I got my stitches removed 2 weeks post-op. It was quite painful at some point. Most of the stitches came out with an ease. Incision was covered with bandaid again and was on my way. At previous post I had picture of check-up at 19th of september. 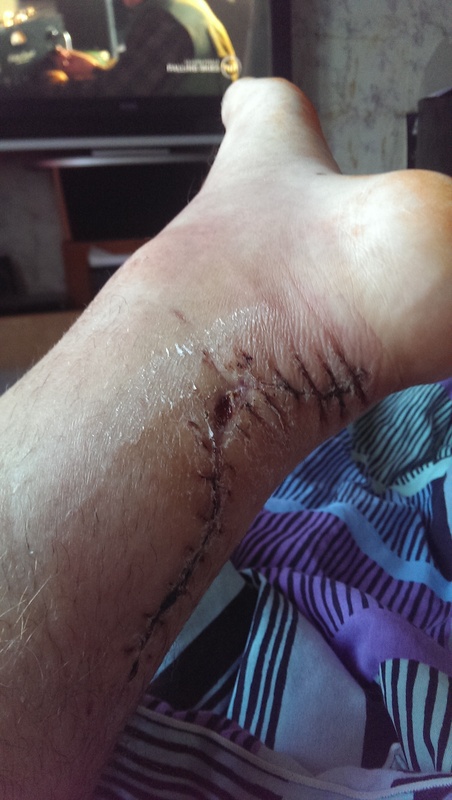 Picture was taken slightly before stitches removal. Was consulting with surgeoun about walking boot (thank you Internet, found achillesblog later), he wasn’t against it. Only told that closest place to get one is Tartu (second largest city in our country, ~100 000 people live there). Tartu isn’t far from Võru (68km) and I had to go there anyway becouse of one appointment and book presentation where I was invited as guest(my photographs are in this book). So told surgeon that I am going to Tartu anyway today and he wrote a persciption for the boot (all digitally like almost everything in our country). You don’t need a perscription to buy a boot in our country but you really want one. Here is why. Our healthcare is compensating up to 90% of orthosis price if you need it and accident was less than 6 months ago. I think it is a wonderful deal. As I mentioned before, I had a manual gearbox car. I didn’t want to go to Tartu by bus, neither with car with manual gearbox, because of the traffic there will be. So I needed a car with automatic transmission. Luckily one of my friends have one and is willing to switch cars with me for the day. I met him at his workplace in Võru and drove home with his car. With only two pedals it is freaking easy. Luckily my right leg was ok and this made me very happy. Few hours later I started my jurney to Tartu. It was a hours drive and went smoothly. First I got to shop where they sell medical orthosis and other stuff. Went in and there were only one older lady before me. Shopkeeper felt sorry for me and pointed me to a chair to sit and wait until she finished with this lady. I have been waiting for about 5-7 minutes and it was my turn. Gave her my ID card (http://id.ee/index.php?id=30470) to check my perscription and she gave me a boot to try on. My leg was still casted and tried it on my good leg, fitted ok. And she packed it in. All I now had t do was paying the bill and in my mind I was ready for big numbers. But boot cost me only 15,40 euros (full prize is 154 euros, I got 90% of discount with perscription). It’s about 20 USD. Shopkeeper was so helpful to transfer my purchase to car too, so I was very thankful for her. Few hours later I was done with all my appointments and other stuff at Tartu and drove back to Võru, switched cars and drove home. For the record, I have quite bad karma. Here is why. I have injured myself a lot of times. For example my left leg has had more accidents than some people on their lifetime. I mean accidents that end up in hospital. 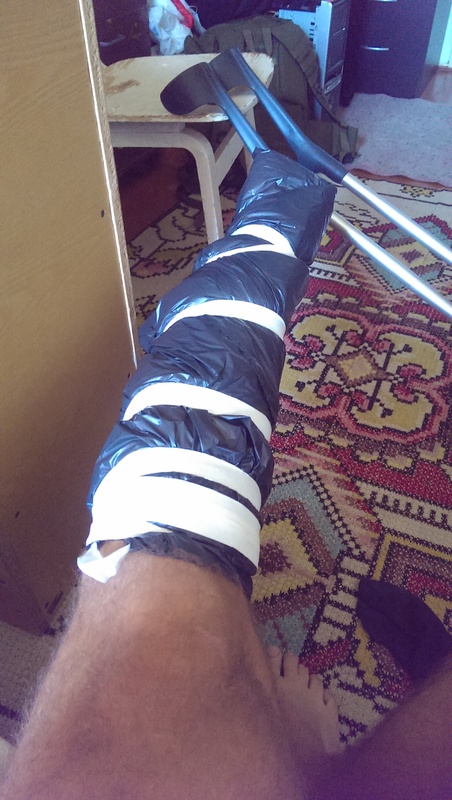 I have broken my leg when I was in highschool, playing basketball. 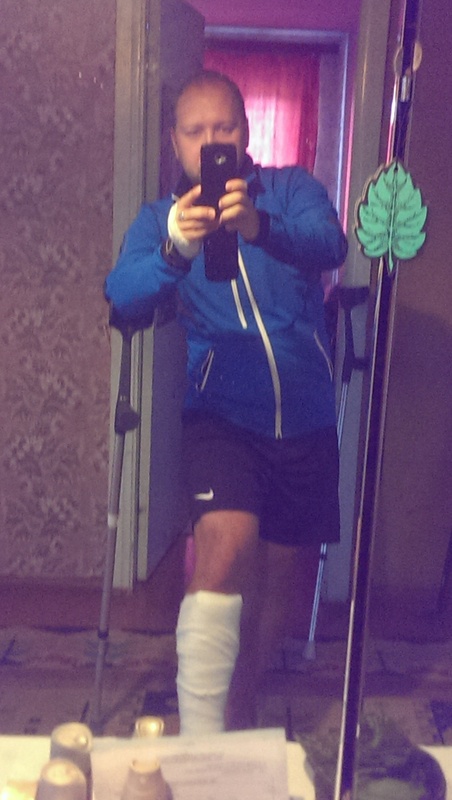 Leg was casted for 3 weeks, couldn’t train for several months. When I was in defence college I cut my knee with barb wire (at field exercise), got few stitches and a straight leg for almost two weeks, have hideous scar on my knee for reminder to be careful. Few years back I misstepped when I was going to take piss at friends place at hayfield and injured ligaments of the ankle joint. Was 3 weeks at home and then slowly started to recover using orthosis. I was able to train again like nothing happened about 5 months later. So I am quite experienced with different foot injuries, also I can operate crutches very well. But injuring achilles tendon, I don’t wish this injury even to my enemies - thats the worst. So I was scheduled to get out of straight cast on 25. of september. 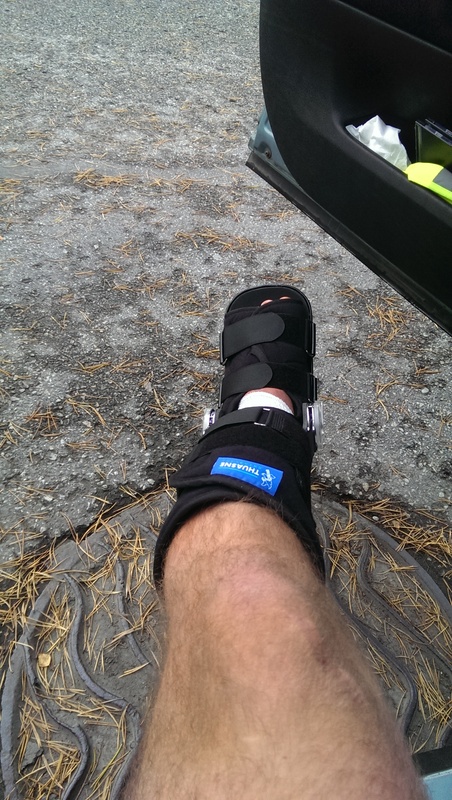 Now that I got my boot I was so eager to get to wear it. So the day came. 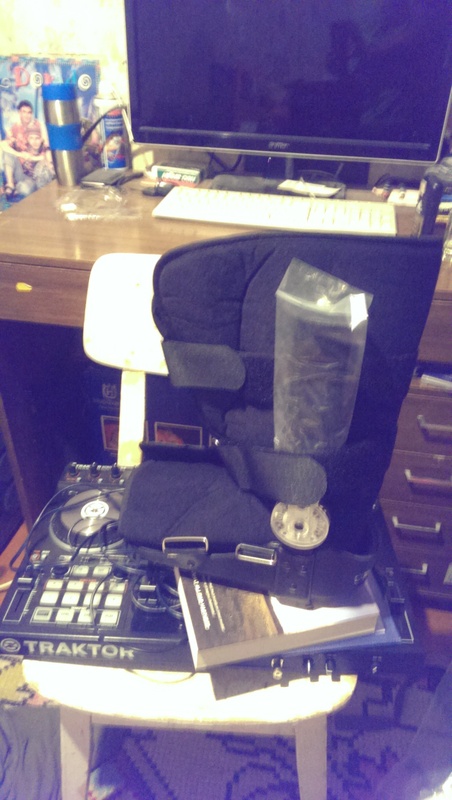 3 weeks had passed and I took my new boot with me to the surgeons office at hospital to get it installed to my leg. Getting off the cast was like a relief. Finally I could move my leg. Unfortunately as the tendon wasn’t so long any more I couldn’t put my leg to 90 degrees. Luckily my new boot had adjustable ankle and that wasn’t a problem. So I got it installed and went back to home. It was a good liberating feeling. And I loved velcro. 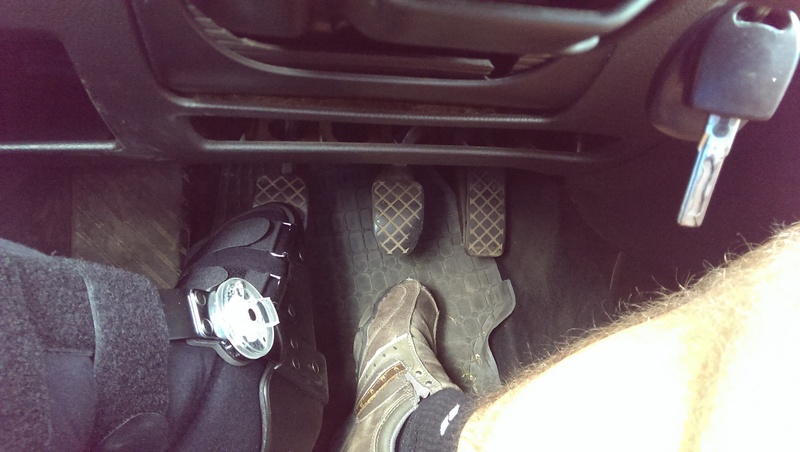 At home I could loosen the boot, take it off and I even be without it. It is fantastic feeling. Also I tried to put little bit of weight to it when moving around and that felt allright. Night at the hospital. Still didn’ feel anything on my left leg, couldn’t move it, only lift it with my hands if I wanted to turn myself. Spent half of the evening chatting with my friends at facebook (thank you smartphones and your data plans). didn’t have phone charger with me so had to save battery and only briefly browsed 9gag. At some point I felt quite tired and tried to fall to sleep, after a while it succeeded. Woke up in the middle of the night about 3 a.m. Wasn’t happy about that, I thought i couldn’t get any more sleep. Luckily I was wrong. But that wasn’t all. I love quite creepy places and this hospital floor was priceless for that. Also I have to mention that my rooms door was open. Almost all lights were off during the night. Nurse who was appointet to night watch was snoring throughout the floor somewhere opposite hall. And yes, she was female, older lady. It was funny. After some time I heard steps and klicks from corridor closing my room. Have you seen horror movies? Steps came closer and closer in slow but steady rhytm, like serial killer hunting his next prey. I wasn’t scared, I was excited to see what the hell was that. So in a few minutes one older gentelman was passing my door in slow pace with a walking stick, that extra steady one with 4 legs. So nothing to be afraid of, he was just walking. At some point at I fell at sleep again and woke up in the morning around 7 am. Woke up couse of pain in my leg - magic-macig. 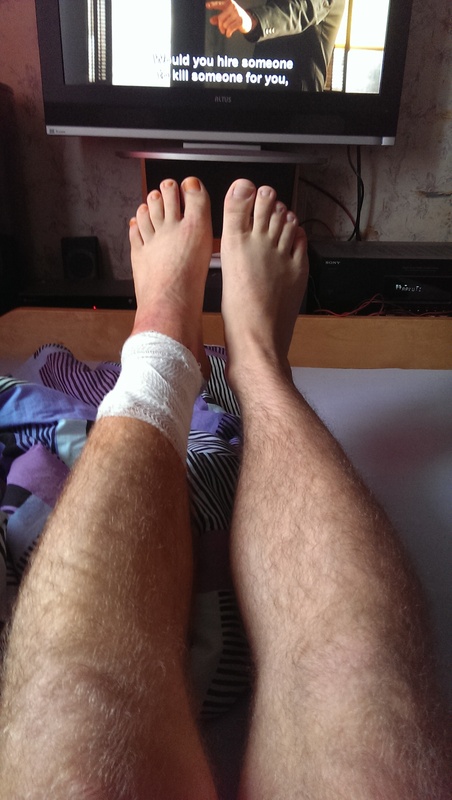 On one hand, my leg was casted at position where the foot is stretched (like ballerina) and that was unconfortable but on the other, now i felt that little cut-in on my ankle what one nurse did for me when she was shaving my leg. Didn’t feel the surgery incision at all. At first I tried to get used to pain but after a while that didn’t work out for me and called nurse to give me painkillers. I also asked about breakfest time because I was starving. Haven’t eaten anything for about a day now. Last time was fast food at MacDonalds drive-in after party saturday night. Now it is monday morning. Thankfully my prayers were answered few minutes later and got breakfast. Porridge isn’t my first choice of food and tried to eat it but couldn’t - wasn’t just my taste. Luckily there was sandwich material and coffe, so that was nice. My hunger games were over and felt a lot better. Time is relative depending which side of toilet door you are waiting, so was the case here. Was waiting inpatiently to clock to get 9 so most of the hospital personnel tome come to work and surgeon can look at my leg. At some moment nurse arrived and instructed me to get dressed. I only had my training clothes with me, sweaty stuff but it didn’t bother so much because idea of going home left everything else in shade. At some point I called to my work and told them to come and get me, don’t know exactly how long I will be here but it can’t be too long. So I got dressed and took sat down on wheelchair. Nurse pushed me to fourth floor, where was my surgeons examination room for regular visitations. So again I had to go to bed, this time I was laying on my stomach and he or the nurse cut bandage from my leg and relieved the wound. 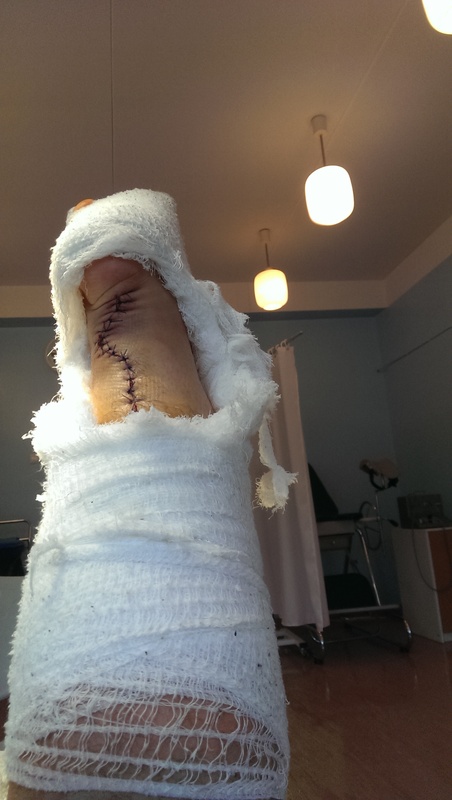 Surgeon examined it and was pleased with the result. Nurse tied my leg up again and I got back to wheelchair. Got few tips for surviving and I was instructed to return in wednesday to clean the wound and replace bandage. I was wheeled to first floor (ground floor) where i was glad to see my coworker to be already there and we left the hospital. Nurse gave the wheelchair final push and I started to fit myself in cars passenger seat. And there they were - packed neatly into plastic bag - painkillers, instructions were included. I also got myself crutches to walk around. I left my personal car to hospitals parking lot and coworker drove me home. Walking with crutches is easy. Walking with elbow crutches with stuff in your hand (one flip-flop for example) isn’t so. I live in two storie building so climbing the stairs was quick and painless. And I was home at last. Ofcourse I took a selfie about myself when I saw that my clothing is in the order of my national flag blue-black-white. Was happy to see that. I changed clothes and layed down to bed looking some comfort. Pillow under left leg to keep it little bit elevated and started surfing the Internet. For some time it was quite ok. Ate some painkillers for leg pain and started my healing process. At fist it is fun to just lay there. After a while it starts get boring as hell. Even with all the possibilities tv or Internet holds. That was my first day at home. Only thing that I have thought was reducing amount of food I am eating. Don’t want to get fatter than I am now, been there and done that. So without any scale to weigh my food, I just eat smaller portions. First day at home didn’t surprise me with anything extraordinary. The next day at some time I contacted one of my friends to get my car from hospitals parking lot. Also I was sick of using freezed chicken to cool down my leg and needed cold gel ice pack. In the evening he came with other friend and we wen’t to the city to collect my car. On the way back we also went to my workplace to get those gel packs from medical center. It went fairly quick, friend parked my car near my house and after brief conversation he left. First post-op check up (second if you count the one at the hospital before leaving). I was called back to hospital to clean and check my wound. Driving there was quite tricky but it didn’t differ from the first time when I drove to hospital. So don’t have to speak about it very much, left turns are hard. I am at fairly ok physical shape, not great but I manage to be. First times I went to hospital it was good challenge. I hade to make several breaks to get to fourth floor from the parking lot. Hands were exhausted and I started questioning my physical abilities. Thankfully as days went by, I grew stronger and distance like this wasn’t hard at all. 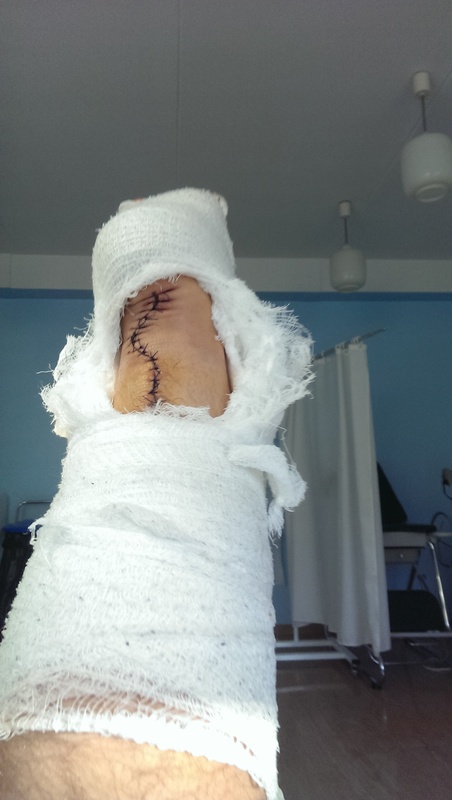 Surgeon looked at leg and was pleased with progress and I was on my way again. I was scheduled to get my cast changed after three weeks from the surgery. I live in small village called Haanja. It’s center of the parish Haanja. Parish is 170 km². Closest town (~15 km) is Võru (the one I was referring in my story, with 15 000 people). Closest hospital is also there. Estonia is very small country, located in Eastern Europe, one of three Baltic States (for more information http://en.wikipedia.org/wiki/Estonia ). We have approximately 1,3 million people overall. Our currency is Euro, we are part of the European Union and NATO. Our most outstanding achievement is invention of Skype (currently owned by Microsoft). In a government level we are known for our e-services. I personally haven’t ever done my taxes on paper. Only in computer and it takes about 2-5 minutes. Paying monthly bills are fairly simple thanks for e-banking. I honestly doesn’t know when was the last time I paid some of my bills by cash or had to go somewhere to pay them on person. You can pay for goods and services with bank card almost everywhere here. Life in general is fairly cheap here and so are salaries ;). And free WiFi. Everywhere you go. No password no nothing, just use. Our national language is Estonian language and most of our country isn’t religious. We don’t have good climate here. There are four seasons, three of them are bad ski days. One is the ski day. At summer, there is possibility that you are at work on both of those days and miss it completely. Ofcourse I am exaggerating but there is also some thruth in it. I am 29 years old. I serve in our country defence forces, been there little over 10 years. Have been training conscripts for most of the time. Seventh of september, year 2014, sunday. Last night (saturday) I had been on a party that was called “Sin City” and main performer was London Electricity, it was season opening party. Had really good time, danced all night and arrived home pretty late (about eight o clock), sleeped few good hours and went to football practice.